Instant Warm Packs from Incontinence Products Plus are heat therapy packs that require no additional power source or microwave oven for use. Each 4” x9” pack has a non-woven covers to ensure patient comfort. Packs are instantly warmed via chemical activation to approximately 125 degrees Fahrenheit. Comfort Warm Instant Warm Packs have a special laminated construction to eliminate leaks ensuring user safety and integrity during therapy. 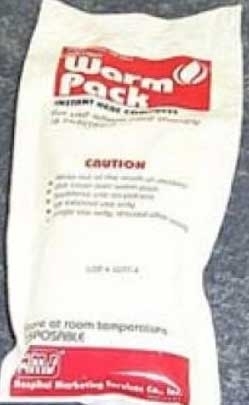 Instant Warm Packs are for use where heat therapy is indicated. They are disposable and for single use only. CAUTION: DO NOT REHEAT TO REUSE. INJURY MAY RESULT. DO NOT USE WITHOUT SUPERVISION. DO NOT USE ON SENSORY IMPAIRED PATIENTS. DO NOT PLACE DIRECTLY ON SKIN WITHOUT A COVER OR A TOWEL. DO NOT USE ON INFANTS. HARMFUL IF SWALLOWED. If swallowed give one or two glasses of water or milk, induce vomiting, and consult physician or Poison Control Center Immediately. If contents contact eyes, skin ope open wound, rinse liberally with water and consult physician. Check patient and pack regularly during product use to prevent leakage. Discard leaking pack immediately. Keep out of reach of children.